DSCN5389, originally uploaded by Prince of Petworth. “Red Velvet Cupcakery will celebrate its Grand Opening at Tangysweet, Dupont Circle (2029 P St. NW) by giving away mini-cupcakes on Friday, July 31. The Grand Opening celebration will begin at 12 noon and last all day. Red Velvet Cupcakery will feature several of its most popular cupcakes including the Devil’s Food, a chocolate buttermilk cake with bittersweet chocolate ganache, Vanilla Bean, a vanilla bean cake with Madagascar bourbon vanilla frosting, and Southern Belle, a red velvet chocolate cake with whipped cream cheese frosting. Red Velvet Cupcakery opened its doors at 675 E St. NW on the corner of 7th at E St. in the heart of the Penn Quarter in January. 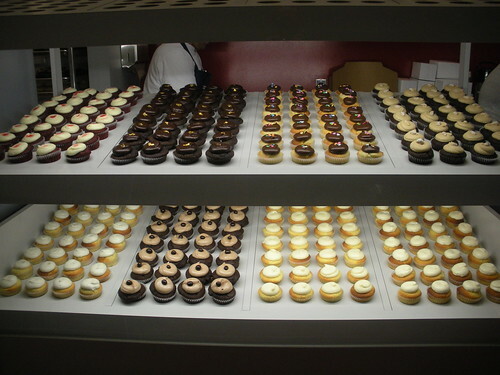 Red Velvet is owned and operated by brother and sister Canada and Aaron Gordon – Washington DC natives. Red Velvet recipes were created by renowned pastry chef, David Guas. Red Velvet cupcakes are made from the finest French chocolate, the best European butter to the aromatic vanillas of the Bourbon Islands in Madagascar and baked in small batches to ensure the highest quality. spite cupcakes Whoa! Glad you made it. LittleBluePenguin Hairy cake? *gags* nevermind, I don't want to know. Friday Question of the Day – What Chain Store is DC Missing?